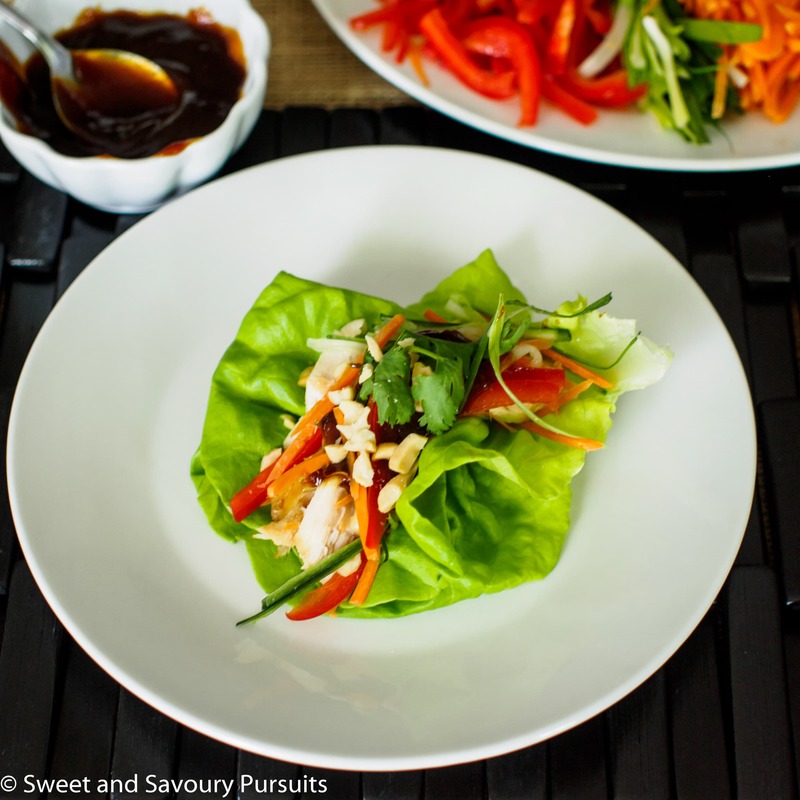 Use leftover roast chicken to easily and quickly create a new dish by making these simple and delicious Chicken and Vegetable Lettuce Bundles. It’s getting warmer out there, so lately I’ve been wanting lighter meals with lots of crispy and refreshing vegetables. Being short on time, I thought I would make use of some leftover roast chicken to make these delicious Chicken and Vegetable Lettuce Bundles. This meal is easy and quick to put together. I used cold leftover roasted chicken and shredded it. You could also warm up the chicken if you prefer. Grabbed fresh vegetables from my fridge, I had carrots, cucumber, sweet red bell pepper and green onions. I made use of my mandolin slicer to slice up the vegetables quickly. Added some fresh cilantro and chopped up some peanuts. I piled up everything on a plate in little bundles, this way people could choose the veggies they prefer. 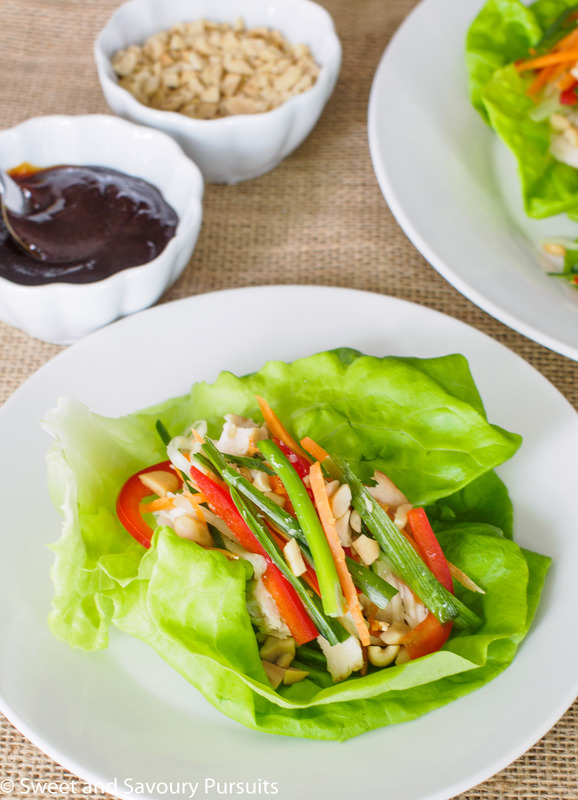 I plan on serving these Chicken and Vegetable Lettuce Bundles with Hoisin sauce, but it would also be delicious with the peanut butter dressing from this Asian Salad with Peanut Butter Dressing recipe. Use leftover roast chicken to easily and quickly make these delicious Chicken and Vegetable Lettuce Bundles. Reheat leftover roast chicken breast and shred it. Wash and dry the lettuce leaves, set aside. Wash and thinly slice all vegetables into strips. Set the lettuce leaves, all sliced vegetables and cilantro on a tray. Place the chicken on a separate plate. Prepare a bowl with Hoisin sauce and another with chopped peanuts. Let people make their own bundles by spooning ingredients onto lettuce leaves, sprinkling with chopped peanuts and topping with Hoisin sauce. You really have awesome photos. The lettuce bundles look delicious! Yes, the fresh vegetables really make it refreshing and I love using my hands to eat! These look perfect for the summer! So healthy & delicious! Yum this looks delicious!! So nice and healthy! These bundles look like a perfect summer meal! These are so colorful and healthy-looking–great for a cool summer meal! Looks so fresh and delicious!! Can’t wait to try it. Thanks Myrna! They are really good, taste a lot like the Vietnamese salad rolls, but without the noodles. Oh my, these look and sound fabulous! Jhuls can eat these to her heart’s content!! Lovely to see you here again; thanks for bringing these and happy Fiesta Friday! Thank you, it was lovely to see you too! We have so much here that I also think Jhuls can eat all she wants! Thanks! Yes I’m also happy to see healthy recipes, looking forward to trying some for sure. Looks like you have Selma’s blessing, so go ahead and eat as many as you like! Looks fantastic and healthy. My kind of meal!